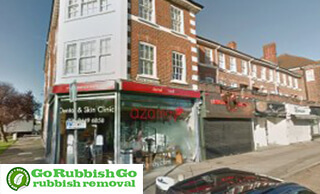 If you care too much for your home in EN4 to sit back and watch it drown in clutter, call Go Rubbish Go immediately and restore your home! Call our company for a house clearance Cockfosters, EN4 and we can revamp and return your home to that once spacious state you fell in love with. 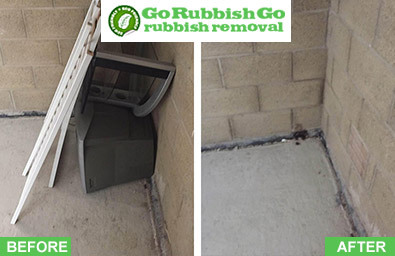 Our professional work will not only remove all the unwanted rubbish but also take it away. We do all the work when it comes to Cockfosters house clearance, and so you can relax and leave it to the professionals. To book with us, a company with more than a decade’s experience, call 020 8610 9182 today! Your savings should not suffer when booking with our company. So if you think you cannot afford our services, think again. In order to prevent you from spending too much on your Cockfosters, EN4 house clearance we have set up numerous deals. We have taken these measures to ensure that you can pay for whatever it is you need. On top of this, you only pay for the items which are taken out of your home. This prevents hidden costs and gives you power to choose what you want to throw away and what price it will cost. For a free quote, or to book, call 020 8610 9182 now. We offer competitive house clearance prices in Cockfosters EN4 and can cater for all your waste related needs without charging you the earth. Why wait? Book now! Our employees have been hand-picked through a system developed by around 10 years of professionalism within the industry. Extensive background checks and carefully planned training have formed what is now our fully competent team of workers. When booking your EN4 house clearance with us, our team are sure to give you the care and attention which you demand. Not only will they remove your junk and follow your orders, but they will also take your junk far from your Cockfosters home, leaving your home completely transformed. 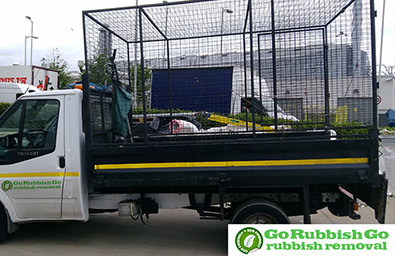 With us at Go Rubbish Go you will have no worries with our team! We guarantee that you will be impressed with the quality of work and the house clearance cost! If you haven’t envisioned it already, picture your home free of the mess which has stopped you from having a tidy and welcoming home. Having a Cockfosters house clearance EN4 will allow you to begin giving your home that much-needed makeover which will ultimately makeover your lifestyle. Our professional team will ensure that this vision will come to life in no time at all! With the matter of a phone call, we can begin returning your home to its once spacious state, so you can begin to place the new furniture you’ve had in mind for years. Book today by calling 020 8610 9182 and stop dreaming of your tidier home! Hire us for cheap house clearance and you will not regret it! We stand with the environment when dealing with the disposal of your rubbish. With around 85% of your discarded rubbish, clutter and unwanted furniture going to local recycling, we are proud to provide the evidence of our eco-friendly EN4 house clearance Cockfosters service. Our drivers also contribute to the protection of the environment by using as little fuel as possible when making their way to your house in Cockfosters. If you book a house clearance EN4 with us, you will not only benefit your home, but you will also benefit your environment. Book today! Be it a public holiday, the weekend, or even if you think it’s too late in the day for your house clearance Cockfosters, we have a few ways around such problems. We work public holidays and weekends, and if you wish, we will even arrive at your home in the EN4 area the very same day you book with us! We work around the clock so that you don’t have to scramble for a suitable time. So pick up your phone today regardless of the hour or the day of the week and call us on 020 8610 9182. We are sure to meet your needs! Cockfosters, a suburb of north London, located partly within the London Borough of Enfield and the London Borough of Barnet. The suburb dates as far back as the 16th century. One of the jewels of the area is Trent Park, also a county park, and the Chickenshed Theatre Company, an inclusive theatre company which aims to get everyone and anyone involved. Trent Park, in particular, holds a large amount of land, in which, the treetop adventure park – Go Ape, is situated. Neighbouring areas include Oakwood, Osidge, Southgate and Hadley Wood. Cockfosters tube station is a terminus of the Piccadilly line, and the area is also served by the Oakwood station.